In the northern part of Chile several years may go by without a single drop of rain. There are not many parts of the world as dry as that. But large areas get very little rain or snow. We call such regions deserts. In all deserts there is very little water for plants to use. But not all deserts are dry. In the Far North there are deserts even where there is much water in the soil. But a few inches below the top of the ground the water is always frozen. There are other deserts that have water, but it is too salty for plants to use.One such desert is near Great Salt Lake in Utah. But most people think of hot, dry deserts when they hear the word "desert." The Sahara in Africa is the world's largest hot, dry desert. 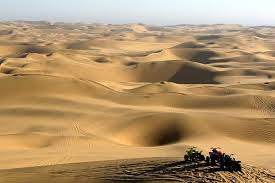 The Gobi Desert in Asia is another very large one. Such deserts usually have great stretches of bare sand. Winds pile up the sand into hills, or dunes. Scattered through the des­erts there may be oases, where trees and other plants grow. Springs or streams fed by rain or snow far away furnish the needed water for green oases. Night can be cold in a hot, dry desert. In the air there is very little water to act as a blanket, and the heat of the day escapes very fast as soon as the sun goes down. Scorching heat in the daytime and shivering cold at night is the rule. Dry deserts, oddly enough, can have bad floods. Any rain that falls is likely to come in heavy showers, the kind we call cloud-bursts. The rain cannot sink into the ground as fast as it falls. It rushes off into small streams and makes the streams overflow. Many travelers in a desert have been stopped by floods. Often there are sandstorms in dry des­erts. There is nothing to break the wind as it blows over the great stretches of sand. Some plants and animals are fitted for living in deserts. Some desert plants have very long roots that can get water from deep in the ground.